There's a stretch during the excellent documentary Weiner in which everything in the world is going right for eponymous former congressman Anthony Weiner. It’s highlighted with the politician sitting in a subway, getting nods of approval from New Yorkers reading articles proclaiming his pole position in the race to be New York City's next mayor. The train ride comes months after his first fall from office, and it's clear he's enjoying the serenity and validation from his potential constituents. In his own way, Anthony Weiner has very much earned this one moment in the sun. At least until the bottom drops out because Anthony Weiner is constructed to self-destruct. He's a fascinating man, the rare loser who needs to win to add more height for his inevitable, self-inflicted falls from grace. Weiner starts off as a comeback tale, devoting its first act to Anthony Weiner’s attempts at a political resurrection in 2013, two years after resigning from Congress in shame from a sexting scandal. Anthony Weiner’s a dreamer, following what for all intents and purposes is a quixotic quest to win New York’s mayoral race, despite his recent woes. And yet there he is, drawing the rabid support of crowds and getting audiences to boo candidates who crack jokes about his indiscretions. He's feisty, cocky and electrifying, especially when compared with the less than thrilling Bill de Blasio. Scenes in which Anthony Weiner dances during parades or talks back to rather condescending foes offers a glimpse as to why voters fell in love with him in the first place. Even at his worst, it’s clear he cares deeply for his constituents, his passion guided by good intentions. 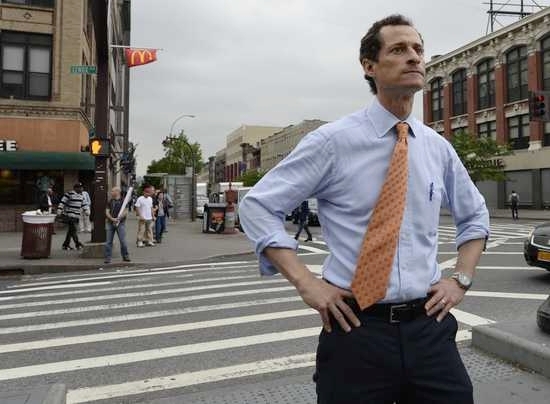 Weiner posits its central figure as a man of his time, for better or for worse. His speeches in Congress, and the ones on the campaign trail are short and fiery enough to draw viewers, as is his scrappiness and the stereotypical New Yorker persona that makes him oddly charming. The film outlines clearly why his star shone so bright in the first place. The man even married into American political royalty when he wed Huma Abedin; Hillary Clinton has essentially described her as a second daughter. That Anthony Weiner is able to earn an attempt at a second chance, and even spend a few glorious moments in the lead. Anthony Weiner is a modern candidate in the worst ways too. His first fall started with an accidental Twitter posting he did not intend to go public, which spiraled into a much larger scandal. People are often capable of some forgiveness for one mistake, especially if the person shows at least a modicum of remorse as Anthony Weiner does on the campaign trail. But when the person makes the same mistake again, exposed via a tabloid website by a 23-year-old woman named Sydney Leathers, forgiveness takes a back seat to moral indignation and a flurry of tweets and mediocre comedic material courtesy Bill Maher. Weiner elides over the candidate’s handling of the first scandal aside from a few denials and his resignation. Perhaps it wasn’t as interesting as what happened the second time when Anthony Weiner couldn’t keep track of the occurrences and completely lost any contact with composure during a meltdown with MSNBC's Lawrence O'Donnell. The interview itself is a trainwreck; that Anthony Weiner rewatches the train skid off the rails the morning after is painful and weirdly right. The description fits the tone of the film’s final two acts, whether it’s watching the candidate get into a yelling fest with a bigoted voter or, worst of all, the clear strain the situation is taking on his marriage with Huma Abedin. Directors Josh Kriegman, a former aide to Anthony Weiner, and Elyse Steinberg make it clear she’s hurting too, especially when she has to fend off attacks from media members speculating why she’d remain married to him, then criticizing her for their speculation. Everything is almost too perfect to create a situation like the one belonging to Anthony Weiner. A man who can’t control his impulses (sexual or anger) cheating on his wife through texts, Twitter, and Facebook, with a name that is at the root of the scandal in the first place makes him the perfect candidate for this level of failure. The danger though is when those scandals block out the wishes of the people, who are depicted in Weiner flailing for attention and asking the press to care about their needs, what they want from candidates. All they want is to hear his proposals, yet their voices are drowned by camera clicks and inane questions about a man’s idiocy. That’s the saddest thing about Weiner; the man could have done a lot of good, but he couldn’t get out of his own way to do it.